They might have weapons but it seems the Indonesian military don’t have a sense of humor after removing a statue of a tiger from a military base for “looking funny.” The famed statue became the subject of an internet meme due to its cartoon-like features. 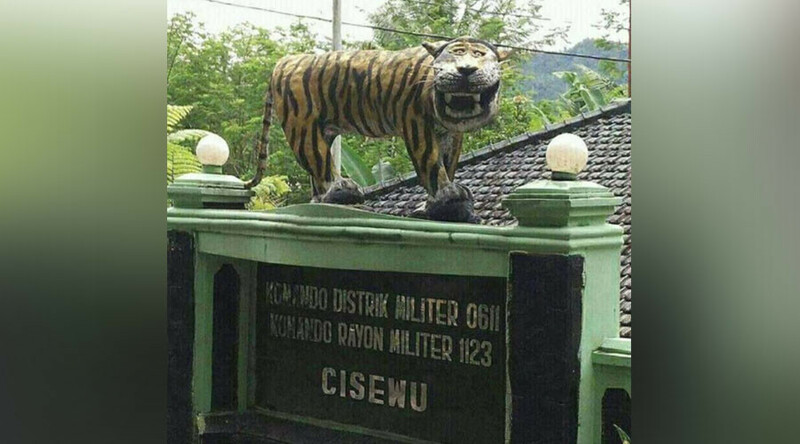 Known as the ‘Cisewu Tiger’, the statue was removed on Monday after standing proud above the West Java military base for six years. The tiger is supposed to represent the mascot for the Siliwangi Military Command but his features have been deemed more welcoming than threatening. "Tigers should look fierce because they represent bravery and resilience," military spokesman Mokhamad Desi Arianto told AFP. "When some people criticized the statue for looking funny, we couldn't ignore it." The tiger recently became the subject of ridicule online and the subject of internet memes after garnering attention for its smiling face. Some very skilled Photoshop users skillfully placed the ‘Cisewu Tiger into movie posters and their own lives. Meme-lovers mourned following news the statue was removed, again taking to Photoshop to place the tiger in a heaven populated by Michael Jackson, 2pac and Harambe. Facebook page Kementerian Humor Indonesia, one of the first to publicize the meme, posted a tearful farewell to the tiger.